LEICESTER, England (AP) - February 4, 2013 (WPVI) -- He wore the English crown, but he ended up defeated, humiliated and reviled. Now things are looking up for King Richard, III. Scientists announced Monday that they had found the monarch's 500-year-old remains under a parking lot in the city of Leicester - a discovery Richard's fans say will inspire new research into his maligned history. University of Leicester researchers say tests on a battle-scarred skeleton unearthed last year prove, "beyond reasonable doubt," that it is the king, who died at the Battle of Bosworth Field in 1485, and whose remains have been missing for centuries. Richard, III, the last Plantagenet King of England, has been found," said the Bone specialist, Jo Appleby, said study of the bones provided, "a highly convincing case for identification of Richard, III." The Plantagenets were a royal dynasty whose strong-tempered rulers conquered Wales, battled France, and help transform England into a thriving medieval kingdom. The last of the dynasty, Richard, III, was also the last English monarch to die in battle, immortalized by William Shakespeare as a hunchbacked usurper who left a trail of bodies - including those of his two princely nephews, murdered in the Tower of London - on his way to the throne. DNA from the skeleton matched a sample taken from a distant living relative of Richard's sister. Geneticist Turi King said Michael Ibsen, a Canadian carpenter living in London, shares with the skeleton a rare strain of mitochondrial DNA. She said combined with the archaeological evidence, that left little doubt the skeleton belonged to Richard. Ibsen said he was,"stunned," to discover he was related to the king - he is a 17th great-grand-nephew of Richard's older sister. "It's difficult to digest" he said. Mike Pitts, editor of British Archaeology magazine, said he found the evidence persuasive. "I don't think there is any question - it is Richard, III," said Pitts, who was not affiliated with the research team. He said it was one of the most exciting archaeological discoveries in ages. "The identification of the king is just the very beginning of a whole range of new ideas and research that will change the way we view this period of history," he said. Richard, ruled England between 1483 and 1485, during the decades-long tussle over the throne known as the Wars of the Roses. His brief reign saw liberal reforms, including introduction of the right to bail and the lifting of restrictions on books and printing presses. His rule was challenged, and he was defeated and killed by the army of Henry Tudor, who took the throne as King Henry, VII. Many historians say his bloodthirsty image is unfair, and argue Richard's reputation was smeared by his Tudor successors. That's an argument taken up by the Richard, III Society, set up to re-evaluate the reputation of a reviled monarch. The society's, Philippa Langley, who helped launch the search for the king, said she could scarcely believe her quest had paid off. "Everyone thought that I was mad," she said. "It's not the easiest pitch in the world, to look for a king under a council car park." Now, she said, "a wind of change is blowing, one that will seek out the truth about the real Richard, III." For centuries, the location of Richard's body has been unknown. Records say he was buried by the Franciscan monks of Grey Friars at their church in Leicester, 100 miles, (160 kilometers), north of London. The church was closed and dismantled after King Henry, VIII dissolved the monasteries in 1538, and its location eventually was forgotten. Then, last September, archaeologists searching for Richard dug up the skeleton of an adult male who appeared to have died in battle. Appleby said the 10 injuries to the body were inflicted by weapons like swords, daggers and halberds and were consistent with accounts of Richard being struck down in battle - his helmet knocked from his head - before his body was stripped naked and flung over the back of a horse in disgrace. She said some scars, including a knife wound to the buttock, bore the hallmarks of, "humiliation injuries," inflicted after death. The remains also displayed signs of scoliosis, which is a form of spinal curvature, consistent with contemporary accounts of Richard's appearance, though not with Shakespeare's description of him as a, "deform'd, unfinished," hunchback. Researchers conducted a battery of scientific tests, including radiocarbon dating to determine the skeleton's age. They found the skeleton belonged to a man aged between his late 20s and late 30s who died between 1455 and 1540. Richard was 32 when he died in 1485. The discovery is a boon for the city of Leicester, which has bought a building next to the parking lot to serve as a visitor center and museum. The mayor, Peter Soulsby, said the monarch would be interred in the city's cathedral and a memorial service would be held. The face of England's King Richard, III was revealed for the first time in more than 500 years on Tuesday following a reconstruction based on a skull unearthed from a parking lot in the city of Leicester. 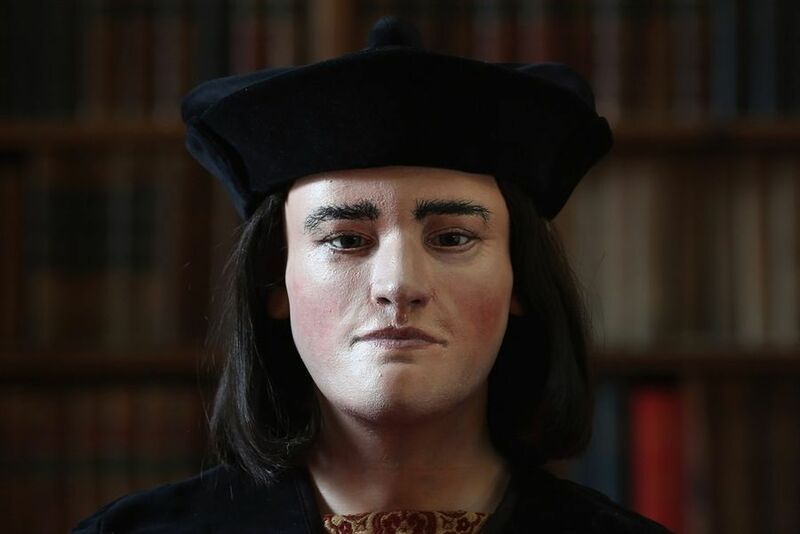 After carrying out a series of scientific investigations on bones exhumed from the site last year, the University of Leicester announced on Monday that the remains belonged to Richard, III, who died in battle in 1485. As detailed by NBC News Science Editor Alan Boyle, DNA was extracted from bone samples and compared with modern-day mitochondrial DNA from two direct descendants of Richard, III's family, including Michael Ibsen, a Canadian-born cabinetmaker who is a 17th-generation descendant of Richard, III's eldest sister, Anne of York. The skeleton's relatively delicate structure was consistent with descriptions of Richard, III's physical appearance, University of Leicester historian Lin Foxhall said. 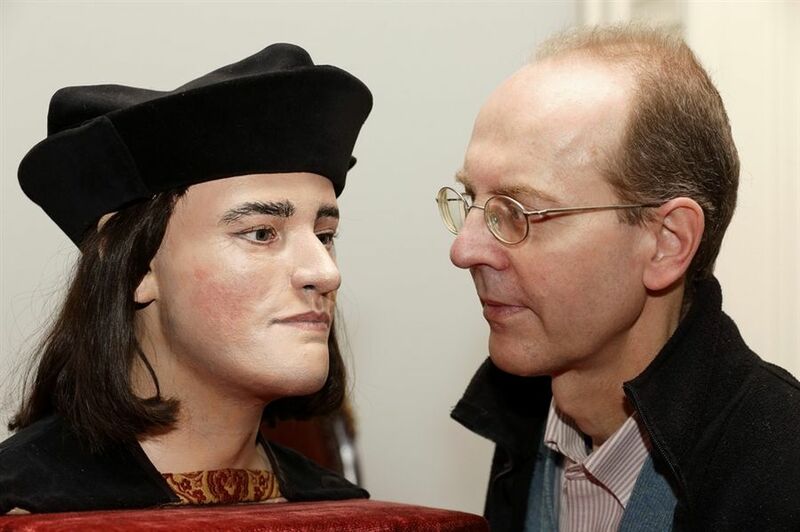 A facial reconstruction based on the skull of King Richard, III is unveiled by the Richard, III Society, in London on February 5, 2013. Michael Ibsen, a descendant of England's King Richard, III, poses for pictures with a plastic model made from the recently discovered skull of the king, during a press conference in London on February 5, 2013. Yes, and he died at only 32! Are they going to put him on display? Do they put mummies on display in England? Yep! Shrunken heads too! Hypocrisy I know but for some reason removing a body from a Egyptian tomb and putting it on display isn't viewed as wrong. That being said I don't think they would display a newly discovered mummy. I could be wrong though. I watched a documentary thing on him last night. No. To quote our news anchor, "Next year, they will give him a funeral, 'fit for a king.'" I have no idea why they are waiting so long. Had he been one of those great well-preserved mummies they find occasionaly, maybe. My guess is because he is only a skeleton. A row has erupted between York and Leicester about which city has the right to bury Richard III's remains. There are calls for a Leicester Cathedral interment, close to where he was found. However King Richard grew up in North Yorkshire, and York City Council is writing to the Queen asking for permission to bury him at York Minster.